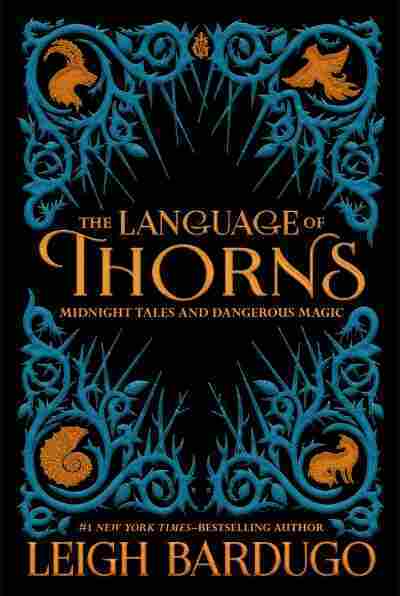 'The Language Of Thorns' Will Ensnare You With Dark Magic Leigh Bardugo's new The Language of Thorns is a collection of fairy tales set in the world of her Grishaverse books — a world of dangerous magic where happy endings may just involve minimal murder. The hardest, sharpest, most attractive magic of fairy tales is their power to make you both want to live inside them — and be glad you never have to. Good fairy tales balance sweetness and nightmares. They are candy apples with razorblades inside; kisses touched with poison. Bad ones are nothing but sweet. They coddle and muffle and take all the sharp, dangerous edges off of the dirty business of learning important lessons in a world that's rarely as nice as we want it to be. The bad ones sing Careful what you wish for and Sometimes pretty isn't as important as smart with choruses of cute mice and bluebirds. But the good ones don't end before there's blood on the knife. And Leigh Bardugo gets that. I don't know where she learned it. She seems like a perfectly nice person. But now that the author of Six of Crows and Crooked Kingdom has turned her hand to re-purposing some of our most familiar fairy tales as the foundational documents of childhood in her "Grishaverse" (that world in which her best stories all take place), what we have are a handful of gorgeous, cruel and almost wistful windows onto the dreamscapes and hard lessons of her alternate universe. Language of Thorns is a collection of fairy tales, illustrated by Sara Kipin, which read far more Grimm than Disney. These stories offer no simple architecture of good and evil, but force you to live inside their clockworks, fear and desire combined and twisted together into that ideal mix that speaks both to children first intimating that the world isn't all pastels and candy, and adults who already know its dangers far too well. These stories offer no simple architecture of good and evil, but force you to live inside their clockworks, fear and desire combined and twisted together. Bardugo divides them among the imaginary realms of her 'verse. The tales of Ravka come first — a clever fox story as an appetizer, followed by "The Witch of Duva," which is a brutal elementary education in familial love and trust and hunger, all wrapped in the rags of Hansel and Gretel. You can smell every inch of it, feel the ache of starvation while reading, and the irresistible lure of "flaky rolls, plums in syrup, egg pudding and a rum cake thick with raisins and brown sugar" all laid out on the witch's table. In Kerch we hear "The Soldier Prince," which is The Nutcracker if The Nutcracker were re-done by the writer's room at Westworld — a brilliant, looping exploration of reality, fantasy and the selfhood of imaginary things that twists and turns and becomes both better and more bitter as Kipin's illustrations crawl and grow along the margins. "Ayama and the Thorn Wood" is Beauty and the Beast, only with a too-pat ending which belies its central premise: that telling truths is costly but worthy and that prettiness alone need not define anyone. "When Water Sang Fire" is a bloody, ambitious, avaricious version of The Little Mermaid whose best flourishes are in the details of Bardugo's drowned world, those small, otherworldly touches which transform it from a simple yarn about a fish-girl wanting legs into something much darker and much deeper and much, much colder. A tale where even hope is dangerous: "Hope rises like water trapped by a dam, higher and higher, in increments that mean nothing until you face the flood." All of Bardugo's stories have a coldness to them, actually, as if her central aim was to make you remember (without ever precisely saying so) that the world is a cruel place that breaks the young, the sweet and the innocent quickest of all. But they also have in their hearts the vengeance of inconsequence. The little things you never see coming. Her heroines, her villains, her brave nutcrackers, wrathful magicians and overlooked daughters are stock characters — as worn and recognizable as a box full of old action figures. But, at her best moments, she repaints them in unusual ways, giving depth to the wicked stepmother, an aching desire to the toy soldier, mercy to the rat king and more selfishness to the good fathers and soft, round mothers than two generations of animated musicals have prepared us for. Her stories, most of all, feel chewed. As if they'd been told a thousand times around a hundred winter fires. As though Bardugo had heard them as a child in some distant place and lived with them ticking and crying inside her for years before letting them out. They are not sanitized. There's a sense of monstrousness living behind the thickets of the words. Hers are fairy tales with all the darkness intact. Which, maybe, is precisely what we need right now.